It was only a matter of time before I remade one of my favorite recipes – Spaghetti and Meatballs – into a Feast Under $5. I will admit it was painful- cutting out some key ingredients, making a few substitutions – but I think the result is still quite good, and only half as expensive. A few notes: Because I’ve omitted the flavor agents of bay leaves and wine (not pantry staples, so we can’t afford them), this sauce will really need the time to simmer and deepen, so make sure you’re giving it at least a few hours to cook. The active prep time for spaghetti and meatballs is actually pretty minimal, so make it in the morning and leave the pot on low all day. For cost reasons I’ve also switched from a bread and milk combination to Italian bread crumbs. Keep in mind that since the crumbs have less moisture you may need an extra egg to get the right consistency, but using flavored crumbs also saves money – no extra cheese in the meatball mixture. Speaking of, the biggest cost savings in this recipe comes from altering the meat mix. Instead of beef, pork, and lamb, I’m using mostly beef (get the fattiest ground beef) and pork. And yes, you could save even more money by using less expensive (read: treated with hormones) meat, but don’t. The point of this feature is to prove that with a few creative changes you can still afford to eat meals made with high quality ingredients. And ok, I know I didn’t quite get the cost under $5. But I’m guessing that when you see the leftovers you’ll let it slide. Put onion, parsley, basil, oregano, red pepper, and garlic in a large pot, drizzle with olive oil and saute over medium heat for a few minutes. Once the onion is tender, add crushed tomatoes and tomato paste, stir to combine. Salt to taste. If you want chunky sauce, leave as is. If you want smoother sauce, pour into a blender/food processor, blend until smooth, then return to pot. Let simmer for at least 2 hours, but the longer you cook, the more the flavors will incorporate. For meatballs: Mix meat with the bread crumbs, egg, parsley, and salt. Mix everything together until incorporated, but don’t overwork it – a trick from my mom. Form into balls and place in a glass baking dish. Drizzle with olive oil and bake at 350 for 15 minutes.When you remove the meatballs from the oven, they will be lightly browned and technically ready to eat (you should try one at this point, just to be sure). But the final step is a nice hot bath in your sauce. 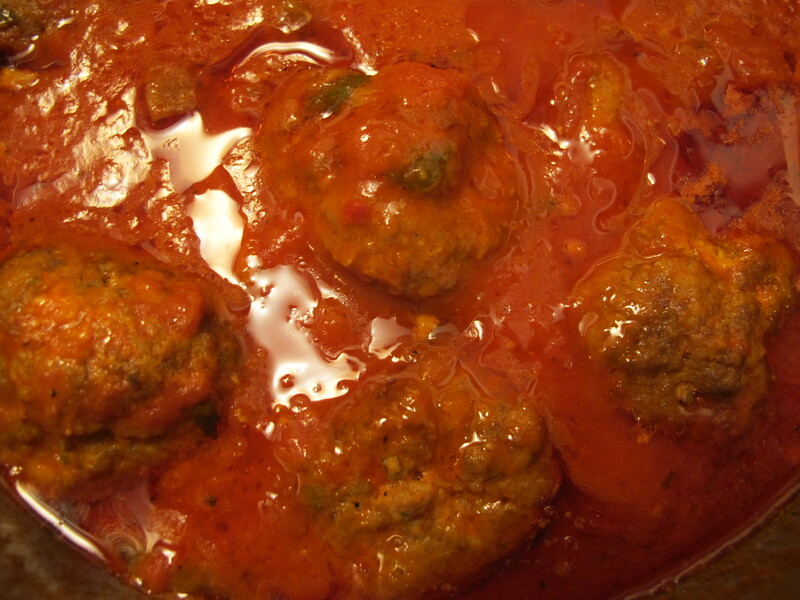 Spoon your meatballs into your waiting pot and simmer for 45 minutes or longer. If you are wondering what to do with the olive oil and meat drippings left in your glass pan, then I have taught you nothing. Those go in the pot with the sauce- don’t waste the delicious.